The Hakko FX-888 Soldering Station has become one of QSource.com's most popular items because of its powerful features and small footprint. Dave Jones from the Electronics Engineering Video (EEV) Blog is also a big fan of the FX-888. He has commented on its solid build and award-winning design in his videos. Well, good ol' Dave realized that he often couldn't remember if he had left his FX-888 iron on. The soldering station has one L.E.D. light that only glows red when the iron is heating up. 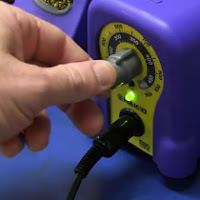 In his EEVblog #242 – Hakko FX-888 Soldering Iron Hack video Dave demonstrates a fairly simple solution to what he calls "an annoying feature." Dave came up with a way to replace the existing red L.E.D. with a dual-color red/green L.E.D. that will toggle between colors depending on if the iron is on or not. In this video, he shows how to open the FX-888 unit; gain access to the L.E.D. 's board; and through schematic drawings, his solution to installing new transistors and the dual-color L.E.D. light. If you're the type of person who shares Dave's annoyance and you like to tinker around inside electronic devices then, "Bob's your uncle," this solution is just the thing for you. 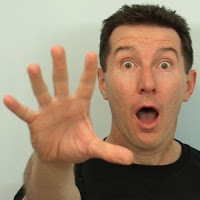 But we have to warn you, the procedure that Dave presents in the video will void your warranty! Please proceed at your own risk. For more information about Hakko soldering products please visit the Hakko Department at QSource.com or contact us via phone (800-966-6020) or email. For more entertaining and informative videos from Dave Jones please visit the EEV Blog's YouTube Channel. You can simply use a common-anode dual LED. Since green GaN LED's have a higher Vf, the red LED wins and turns off the green LED, when they are in in parallel. I did this mod with no transistor, just two resistors.